Recently I installed windows 8 Beta version on my PC. My friend told that it is a trial version and it will expire soon. I do not know how to check the expiry date and also do not know how to update it. Please give the expiry period of Windows 8 also tell me how to update the full version at the time of expiry. Will I get trouble if I exceed expiry date. Help me out soon so that I can take decision against operating system !!! Yes, Microsoft have launched a Windows 8 Beta version and the full version is yet to be released soon. This version have a expiry period of 90 days. At the left end of the desktop, you can see the watermark which will show you the license and how long the license will last. You can do windows update by connecting PC with the internet so that you will get a frequent update from MIcrosoft. Microsoft provides 90days trial period to use its Windows 8 beta version. Right click on the computer. Here you can see the date remaining of the trial version. You can check the remaining days of trial period from the bottom left corner of the screen. Turn on your automatic windows update to get the full upgradation after the trial period. windows 8 for 90 days . => Click on "View details in windows activation"
Window 8 package come with the period of ninety days. After expiry your window pack doesn't work. 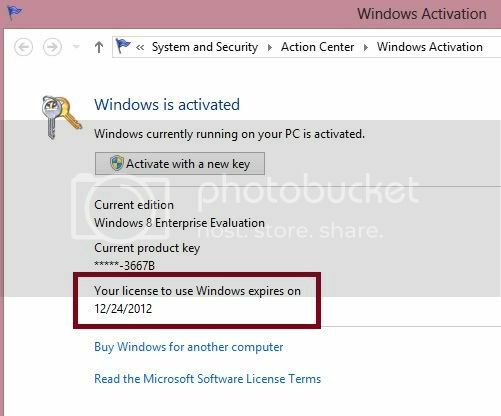 4.In this system window you see expiry date. So i will tell you that how to see or view the expiry date of our windows 8..
First of all go and click on the My Computer button and then double click on it ..
My Computer window will open ..Now just right click on it .A new scroll open now just select properties option and click on it..
A new window will open...this window is the main window of your computer.Because here you can see all the details of your computer..
Now you want to see your windows expiry date ..So you just go down at the bottom ..here your windows expiry date had printed..